Brandon University is an active and engaged organization within the Brandon and Southwest Manitoba economy, with economic impacts resulting from the more than 3,000 full and part-time students, more than 400 faculty and staff, as well as a large number of sessional instructors and students who are employed at the University. These students and educated professionals contribute to our region in many non-economic ways as well — from volunteering to voting. The economic impact of Brandon University is an estimate of the dollars generated by Brandon University, including direct, indirect and induced value that BU is responsible for generating. It is impossible to calculate the full impact Brandon University has on the social, cultural, artistic and sporting scene in Brandon and in Manitoba. Along with economic impacts, Brandon University plays an important role in building the community, developing aspirations for further education and in offering opportunities for personal development. Brandon University contributes more than $74 million directly to the Manitoba economy every year, the vast majority in Brandon. 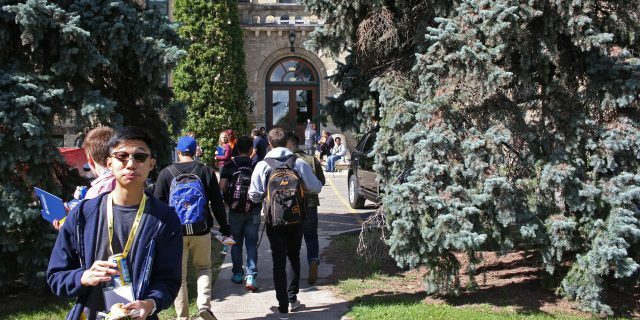 This institutional spending includes salaries and benefits for our highly-educated workforce, scholarships and bursaries for our students, supplies and maintenance, travel, utilities and capital expenditures. Brandon University is a magnet for young people and students, and attracts more than 3,000 students to study, live and work in Brandon. Full-time student spending contributes an estimated $36 million every year to the economies of both Brandon and Manitoba. Through Bobcats games, performances and other Brandon University events, our facilities draw nearly 50,000 visitors annually to Brandon, producing an economic impact of nearly $16 million. The value of a Brandon University degree compounds the earning power of our alumni, with the vast majority choosing to stay in Manitoba. This alumni education premium is worth more than $204 million to our economy every year. Research at BU creates new knowledge, applies knowledge in new ways, and comes up with industry-focused solutions to improve other sectors of the economy. This economic impact of BU research is more than $87 million every year. Brandon University’s economic impact was calculated using two separate methods of analysis that result in unique outputs and the ability to compare BU’s impact to other post-secondary institutions. The Sudmant method is one of the standard economic analyses for universities in Canada. It estimates an annual economic impact of $417.1 million for the university in the 2014–15 academic year. That includes direct, indirect and induced value that Brandon University is responsible for generating. The Canadian Input/Output Model provides calculated impacts in specific areas, including total gross output, total GDP, total labour income, indirect taxes, and jobs created. Brandon University is responsible for producing 927 jobs in the Manitoba economy.